We’d love your help. Let us know what’s wrong with this preview of Loosed upon the World by John Joseph Adams. Is it the end of the world as we know it? Climate fiction (cli-fi) explores the world we live in now—and in the very near future—as the effects of global warming become more evident. Join bestselling, award-w Collected by the editor of the award-winning Lightspeed magazine, one of the first anthologies of climate fiction—a cutting-edge genre made popular by Margaret Atwood. To ask other readers questions about Loosed upon the World, please sign up. This was a great read. Some of the stories did drag a bit, but for the most part the short stories were full of intrigue. This anthology features many prominent fiction writers, but in my opinion the stories by the lesser known authors were remarkable as well. Reading anthologies like this one is a great way to find out about authors writing this type of speculative fiction. I have read Wastelands, another anthology edited by John Joseph Adams; Wastelands is less focused on climate-related "the This was a great read. Some of the stories did drag a bit, but for the most part the short stories were full of intrigue. This anthology features many prominent fiction writers, but in my opinion the stories by the lesser known authors were remarkable as well. Reading anthologies like this one is a great way to find out about authors writing this type of speculative fiction. I have read Wastelands, another anthology edited by John Joseph Adams; Wastelands is less focused on climate-related "the end is nigh" scenarios, and concentrates on apocalyptic situations brought on by more varied catalysts. Though each short story in this anthology is a work of climate fiction, the theme is not belabored; each story introduces a fresh perspective on the catastrophes induced by mankind's carbon-spewing ways. Each story incorporates a non-fiction element, connecting each plot in one way or another to the reality we live in. With topics ranging from flooding and drought, to cross-country pipelines and radioactive animals, each short story elicits a genuine emotional response from the reader. No matter who you are, where you live, or how much money you have, climate change is an indiscriminate force indifferent to the continued well-being of the human population. A quote from Margaret Atwood's short story "Time Capsule Found on the Dead Planet" succinctly epitomizes this anthology: "Pray for us, who once, too, thought we could fly." ...Although there are some stories in this anthology that I didn't really do much for me, and one - That Creeping Sensation (2011) by Alan Dean Foster - that left me wondering how on earth the author managed to sell that heap of nonsense, most of the stories were at the very least entertaining. A few reached into the excellent category. Adams managed to gather a diverse set of stories and as such, the anthology is likely to keep most readers on board until the last pages. Both Bacigalupi in the ...Although there are some stories in this anthology that I didn't really do much for me, and one - That Creeping Sensation (2011) by Alan Dean Foster - that left me wondering how on earth the author managed to sell that heap of nonsense, most of the stories were at the very least entertaining. A few reached into the excellent category. Adams managed to gather a diverse set of stories and as such, the anthology is likely to keep most readers on board until the last pages. Both Bacigalupi in the introduction and Ramez Naam in the afterword mention how interlinked all these changes are. It is not just climate that changes but the entire world around us. If there is one thing this anthology succeeds in, it is showing the reader how complex an issue climate change really is. You may argue Adams' selection of stories of course, but looking at it from that angle, I consider it a job well done. 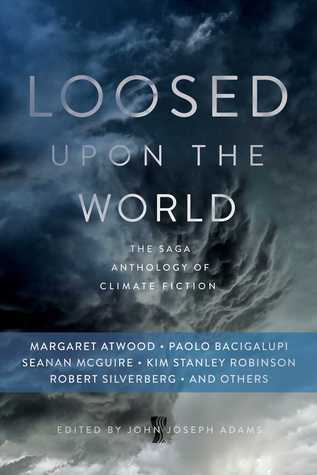 As an avid reader of climate fiction (cli-fi), I was very much looking forward to the release of Loosed Upon the World: The Saga Anthology of Climate Fiction. I’m pleased to report that this anthology definitely met and exceeded my expectations. This volume brings together an impressive collection of authors with a wide range of writing styles and a variety of takes on the broadly-defined theme. As with almost any anthology, there are hits and misses. There were a few stories I’d read before, one As an avid reader of climate fiction (cli-fi), I was very much looking forward to the release of Loosed Upon the World: The Saga Anthology of Climate Fiction. I’m pleased to report that this anthology definitely met and exceeded my expectations. This volume brings together an impressive collection of authors with a wide range of writing styles and a variety of takes on the broadly-defined theme. As with almost any anthology, there are hits and misses. There were a few stories I’d read before, one of which is honestly not among my favorites and wasn’t what I have in mind when I think of climate fiction. However, even the “misses” were still decent works of fiction that only suffered in comparison to the groundbreaking work in the rest of the anthology. I was glad to see contributions by Margaret Atwood, Kim Stanley Robinson, and Paolo Bacigalupi. These three big names were already familiar to me and are essential reading for the emerging cli-fi genre. Robinson’s piece was an excerpt from his Science in the Capital Trilogy. I had read the trilogy already, so this chapter was nothing new to me. But I was glad to see it here because it will point more people in the direction of this important and underappreciated series. I was also glad to see new (or at least new to me) works by Atwood and Bacigalupi, both of whom have crafted (and continue to craft!) excellent stories that include prominent climate change components. My favorite part of this anthology was the wide variety of writing styles and content choices. If I had to pick one story that stood out, though, I’d go with “The Precedent” by Sean McMullen. This story’s premise is so dark and apocalyptic that it could have gone horribly wrong in the hands of a lesser author. However, for me, the vivid descriptions and rich characterization give this story a very real feel in spite of the incredibly stark plot and setting. This story speaks powerfully to the horrors of the climate crisis, challenge us to reflect on those horrors and our involvement in them without shoving any particular solution down our throats. I was sceptical about if I would enjoy this book or not. It sounded good on paper, but I wondered about the execution. A really brilliant and eclectic (in a good way) mix of stories focusing on the climate and the myriad of conditions it could theoretically be put under. Whilst you could argue that it is speculative fiction, the majority, if not all the stories have an essence of realism to them. It really isn’t that much of s leap to get to several of the situations tha I was sceptical about if I would enjoy this book or not. It sounded good on paper, but I wondered about the execution. Anthologies are typically a collection of good material surrounded by weaker brethren; this one is no different. Its better works have one thing in common: they are more than just a tale of climate catastrophe. Some of my favorites: "The Netherlands Lives With Water," for its living, believable characters, and "Shooting the Apocalypse," for capturing the spirit of the those that will survie in the bone-dry Southwest US. Overall, this was good. Of course some stories i liked more than others, my favorites being Truth + Consequences by Kim Stanley Robinson ( this was small bits from his series that starts with 40 days of rain, i definitely want to read more from him), and The precedent by Sean McMullen. I bought this because I love disaster movies and this definitely delivered that. I really appreciated the amount of science in these stories as well. A very readable collection, full of ideas and people fighting and adapting in a changing world. Most of the stories worked for me, I particularly liked Shooting the Apocalypse by Paolo Bacigalupi and Kheldyu by Karl Schroeder. As an intro to climate fiction, it’s left me with a list of authors I’ll need to check out. Environmental Doom and gloom on an unending scale make this anthology’s theme somewhat redundant yet creative. Each story has a different environmental threat. However, they are uneven, some few being well-written while others are barely mediocre. The scope is broad but being saturated in one after another, leaves one feeing helpless, distressed and depressed. Overall pretty mediocre. That said, there are a few very strong standout stories such as "racing the tide" and "hot sky". "the precedent" was utterly disturbing and congratulations to the author for that smack in the face! "The Netherlands lives with water" also stood out. But all in all this is a mediocre collection and speaks to the larger challenge of writing good climate fiction. This collection starts out strong with Shooting The Apocalypse by Paola Bacigalupi and kept up the pace throughout. I immediately started reading this book after purchasing it,and over four hours later I reluctantly had to tear myself away.I highly recommend this anthology to any fan of the post-apocalyptic genre. This is an excellent collection, depressing, but excellent. The stories are hit and miss (as most anthologies are), but overall written well. Reading them made me want to just go ahead and fling myself into the ocean to feed what little marine life is still out there, though. Super depressing read, which I suppose I should've anticipated given the topic. Also, I was rather annoyed that Atwood's contribution was so short. It was good, but it's not even two whole pages, and felt more like an intro to a story than a story itself. I think I'd have been less The stories are hit and miss (as most anthologies are), but overall written well. Reading them made me want to just go ahead and fling myself into the ocean to feed what little marine life is still out there, though. Super depressing read, which I suppose I should've anticipated given the topic. Also, I was rather annoyed that Atwood's contribution was so short. It was good, but it's not even two whole pages, and felt more like an intro to a story than a story itself. I think I'd have been less annoyed with it if it had been at the beginning of the anthology rather than the end. Great stories, pretty scary. I rated 4 stars because some stories were way better than others. a complete disaster. It’s been a pretty tedious read with some patches of good stories in-between. This is a really important book, and while a good number of the stories dragged, it was worth it for the ones that didn't. Good collection of short stories, all featuring climate change as a theme. I was actually surprised, I had only read one of the stories before (although two others were based on stories I had read). An anthology that is relevant, scary, and unfortunately, in some cases, provides portraits of very possible scenarios of how our children’s children may be living. While this large collection will not persuade anyone to not drive over the bridge, it will further motivate those of us who follow the science. My analogy of driving over the bridge came from discussion of climate change (or, as Margaret Atwood calls it, “The Everything Change”) with a friend. He told me that any time a climate change An anthology that is relevant, scary, and unfortunately, in some cases, provides portraits of very possible scenarios of how our children’s children may be living. While this large collection will not persuade anyone to not drive over the bridge, it will further motivate those of us who follow the science. My analogy of driving over the bridge came from discussion of climate change (or, as Margaret Atwood calls it, “The Everything Change”) with a friend. He told me that any time a climate change denier converses with him he tells them, “Oh, you would drive over the bridge.” They ask what he means and he tells them, “Say you and your family are driving down a country road, round a bend, and come upon a wooden bridge. Before the bridge is a large sign that notes that 98.9% of structural engineers declare that his bridge will collapse when the next car drives over it. “So, you would drive over the bridge then,” he repeats. Like its topic and all-inclusiveness, the locales range from Siberia, the Pacific Northwest, the Gulf Coast, Greenlad, Southern California, the Midwest, the Arctic, the Netherlands, the Himalayas, and other place to various states of character’s mindsets. Most of the stories are strong, and while some are short on characterization, the science seems very plausible. The story that impacted me the most was “Entanglement” by Vandana Singh. It is really a set of interlocking stories: a lone woman scientist in the Arctic who puts herself in jeopardy ; a woman in the Amazon who receives help to get the message across; a young lower cast teen boy in India gains insight on his purpose in life; an older woman in Texas who shakes off the old thinking of her dead husband, and a young man in the Himalayas seeking guidance about his and the world’s malaise. In addition to the mass of the world’s population wearing blinders, the other villain is big business as in Seanan McGuire’s “The Myth of Rain”, Toiya Kristen Finley’s Outer Rims, Jean-Louis Trudel’s “The Snows of Yesteryear”, Nancy Kress’s “A Hundred Hundred Daises”, and excerpts from Kim Stanley Robinson’s recent everything change novels. Bottom line: an intriguing, thought-provoking, and disturbing collection of epitaph’s for a disappearing way of life on Earth. This was both the easiest and most difficult anthology to read; wonderfully edited exploration of our emerging climate crisis. Great writers assigned a very difficult and sad task and at the end of the onslaught of dystopic postulations - I'm still rooting for the humans. A collection of dark future climate change stories. Actually, I would rate the overall collection as Five Star for meeting the whole purpose of shocking the reader into taking a bigger personal role in the efforts to do something about Climate Change and its potential impact to the world we live in. But seeing how I am using GoodReads to generate personalized reading recommendations for my reading pleasure, I'm only giving the collection a Four Star rating. It's just that these stories are rathe A collection of dark future climate change stories. Actually, I would rate the overall collection as Five Star for meeting the whole purpose of shocking the reader into taking a bigger personal role in the efforts to do something about Climate Change and its potential impact to the world we live in. But seeing how I am using GoodReads to generate personalized reading recommendations for my reading pleasure, I'm only giving the collection a Four Star rating. It's just that these stories are rather bleak and don't provide as much optimism nor potential solutions to provide hope. I tend to be a problem fixer and gain more enjoyment from stories that propose or envision solutions and elevate hope. Great read with vivid, imaginative stories about how the world might be after drastic climate change. Some of the authors are very well-known, while others are Sci-fi/fantasy writers who are also scientists who work within the field of climate change. I would have given it 4 stars, but took a star away because a couple of the stories didn't meet the criteria set out in the preface, which was that the authors couldn't use technology in order to ameliorate the effects of climate change on the env Great read with vivid, imaginative stories about how the world might be after drastic climate change. Some of the authors are very well-known, while others are Sci-fi/fantasy writers who are also scientists who work within the field of climate change. Big and varied, a look at the near future- not post-apocalypse, although it certainly has some aspects of that - nothing as dystopian as Paolo Bacigalupi's Drowned Cities. The stories are all very well-written and drew me in without being endlessly depressing. Where there is life, there is hope, and these stories are full of human life. This is an excellent, well-written anthology of climate fiction. I was, however, hoping for some more positive, hopeful stories than I found - the impulse to show the worst that can happen is strong, and showing a crisis averted is harder than showing destruction. Many excellent and make you think stories. Also many great authors!